The past ten years have seen the spread of large-scale investments in infrastructure, resources and land across pastoral areas of eastern Africa. In the past these areas were insignificant to states in the region and large capital from beyond – at least compared to the region’s agrarian highlands and Indian Ocean coast. Yet, the recent rush to construct pipelines, roads, airports, wind farms, and plantations – to give a few examples – signals a new spatial politics that binds the pastoral margins ever closer to state power and global capital. These various designs on the range to develop infrastructure, resources, and towns as new industrial centres and markets are often seen benignly. Officials in government and donor agencies tend to view these as part of wider commercialisation and growth dynamics – a sign that the margins are catching up with the rest of the region. Some even go so far as to see them as a precursor to peacebuilding of restive frontiers, ushering in stability through diversification and the creation of new livelihoods outside of livestock-keeping. What is certain is that large-scale investments will have far-reaching consequences for the future of pastoralism in the region. Many powerful actors are involved, from international corporations and financiers to states and local elites, but important questions are raised about who benefits and who loses out, and whether such large-scale projects do indeed deliver poverty-reducing development as is often claimed. These questions are explored through a stream of five panels and 17 papers organised by researchers from the PASTRES (pastoralism, uncertainty, resilience) project and the Agricultural Policy Research in Africa Programme (APRA) at the upcoming African Studies Association of the UK (ASA) conference. Early debates on large-scale investments in pastoral areas turned on headline grabbing figures of the size of proposed projects, such as the $23 billion price tag for the Lamu Port South Sudan Ethiopia Transport Corridor project (LAPSSET), or the scale of proposed land takes for commercial agriculture, such as the 300,000 hectare land lease (since cancelled) to Indian Karuturi Global in Ethiopia’s Gambella Region. A decade on, the large-scale investments have advanced in a more piecemeal way as challenges of implementation have mounted. LAPSSET’s grand modernist vision has not materialised in a sudden multi-billion dollar bang but rather emerged incrementally, such as through the completion of the Isiolo-Moyale highway and the recent opening of Isiolo’s airport. Mass expropriations to establish large-scale commercial farms have by-and-large not come to pass, as only a small part of an agreed area is actually farmed. In this and other instances of protest, local elites have advanced their own interests by playing on the legitimate concerns of residents living adjacent to development sites concerning inclusion, rights and compensation. Various local interlocutors have positioned themselves as key liaisons between investors and communities in and around sites of operational activity, including political aspirants, ward and sub-county administrators, brokers, elders, seers, and young people. 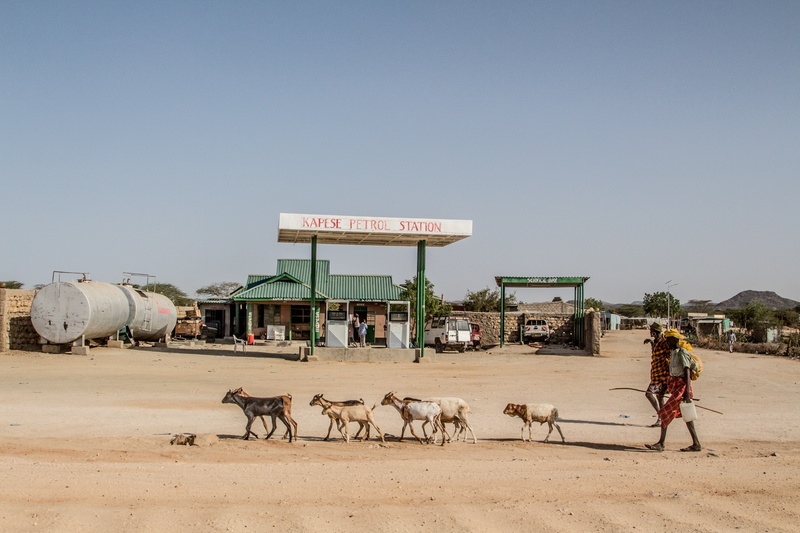 Local capital has been the greatest benefactor of investments in oil in Turkana, or wind in Kenya’s Marsabit County. Wealthier local elites – many with connections in politics or who have worked for international relief or church organisations – have constructed rental housing, guesthouses, bars and restaurants – mostly to serve visitors from other parts of Kenya coming in search of work and business, as well as the staff of larger sub-contracting companies. Thus, while the impacts and influences of large-scale investments on pastoralism still unfold, the early signs can be seen. New territorialisations, local contestations and struggles, and enrichment of local elites are all part of an emerging picture of how the pastoral margins are transforming. These examples also show how large-scale investments enmesh with local political and social relations. Designs on the range by planners and investors are being redrawn and in some cases extraverted by various local interests. The future of pastoralism in eastern Africa is being negotiated now. How it will look is something that involves relationships at all levels, from the headquarters of multi-national investors, to the ministerial corridors in Nairobi and Addis, and all the way down to the elder’s tree, bars and cafes in the region’s growing small towns. The future of pastoralism in the context of uncertainties generated by new investment will be the central theme of our discussions at the ASA conference in Birmingham. If you are at the conference, following the full stream and attend the panels (starting on Wednesday 12 September at 3.30 pm in Aston Webb – WG12 – see here, here, here and here for timings and details of the other four panels on Thursday 13. Note these are correct timings of the panels, but not necessarily the papers). If you are unable to be with us, watch this space for reports on the discussions, and notices of publications emerging.